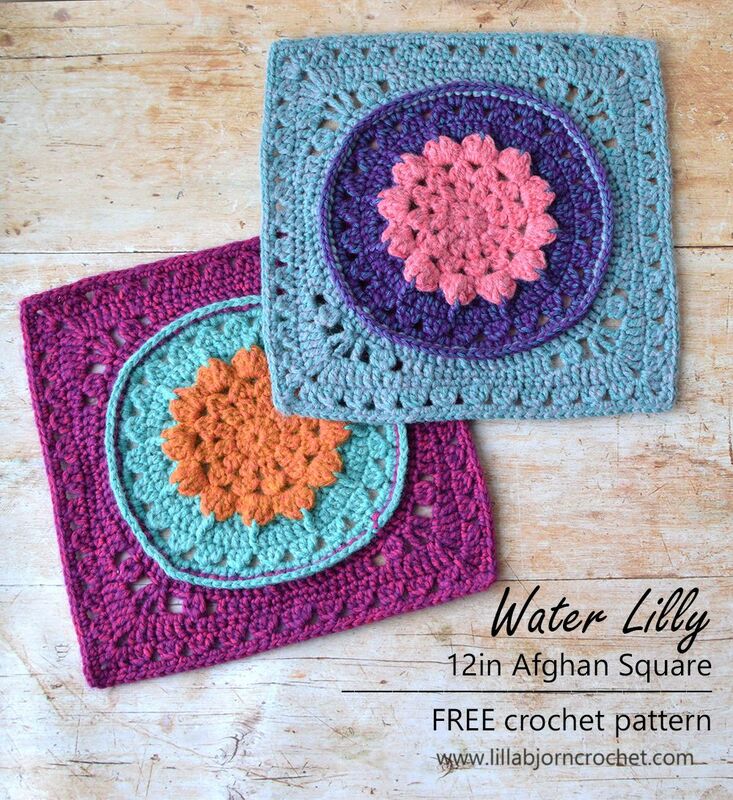 Today is Week 20 of Friends Around the World 3 CAL, and I am happy to introduce Water Lilly 12” afghan square. 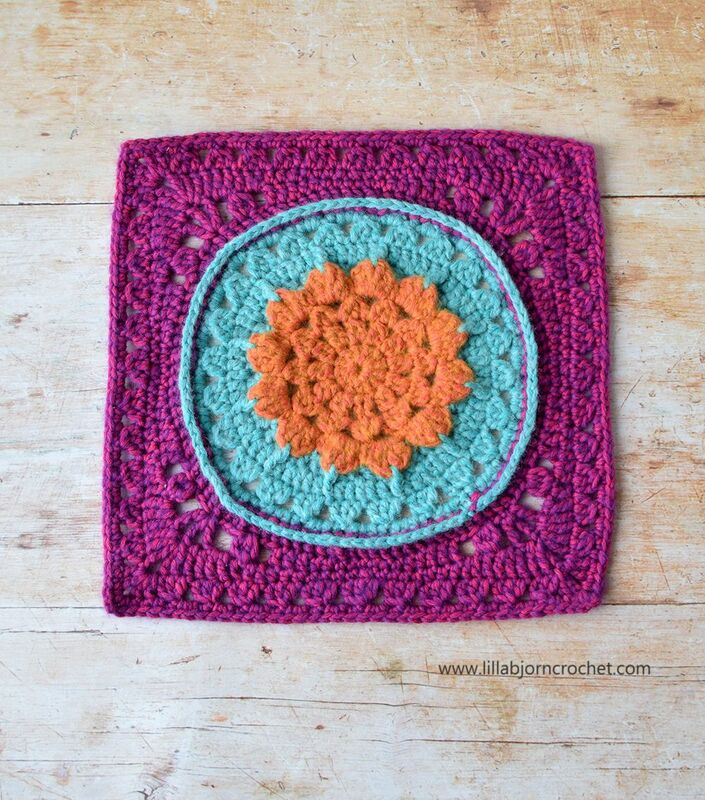 The pattern is free and is available in several languages. Please, scroll down to find and choose the links. And you can read all information about the CAL and participating designers HERE. Enjoy! DISCLOSURE: affiliate links (marked with *) are used in this post. 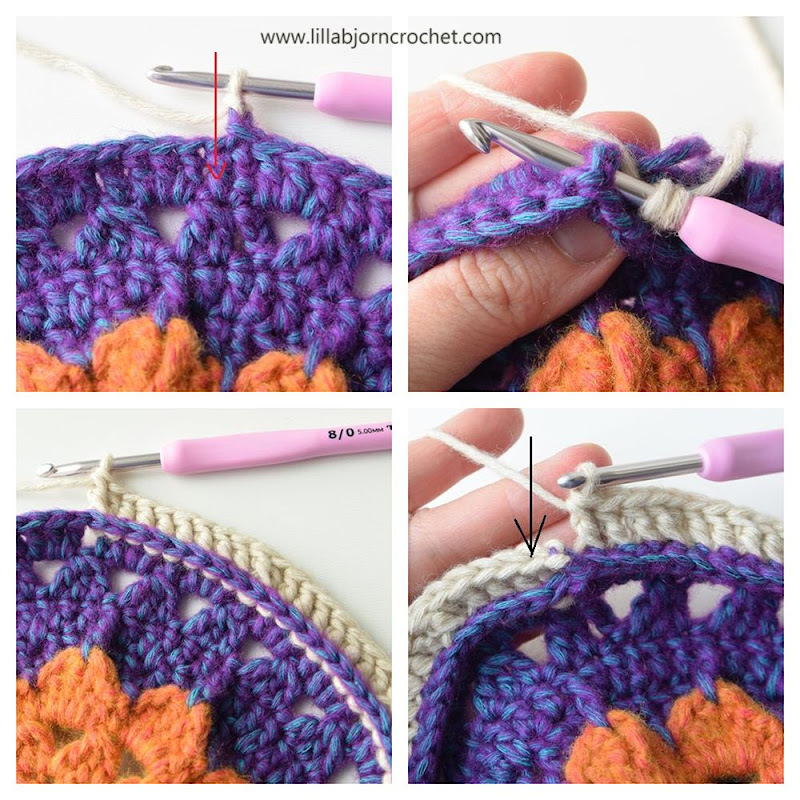 ss (slip stitch) - insert hook in indicated st, yo, draw yarn up and pull second lp through the first lp on hook. 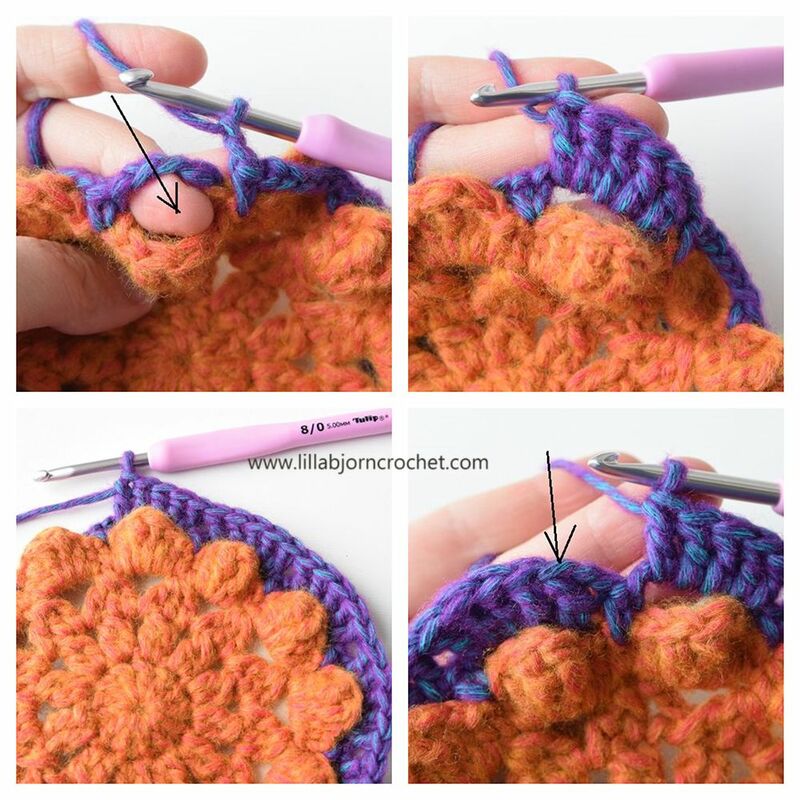 sc (single crochet) – insert hook in indicated stitch, yo, draw up a lp, yo and pull through both lps on hook. 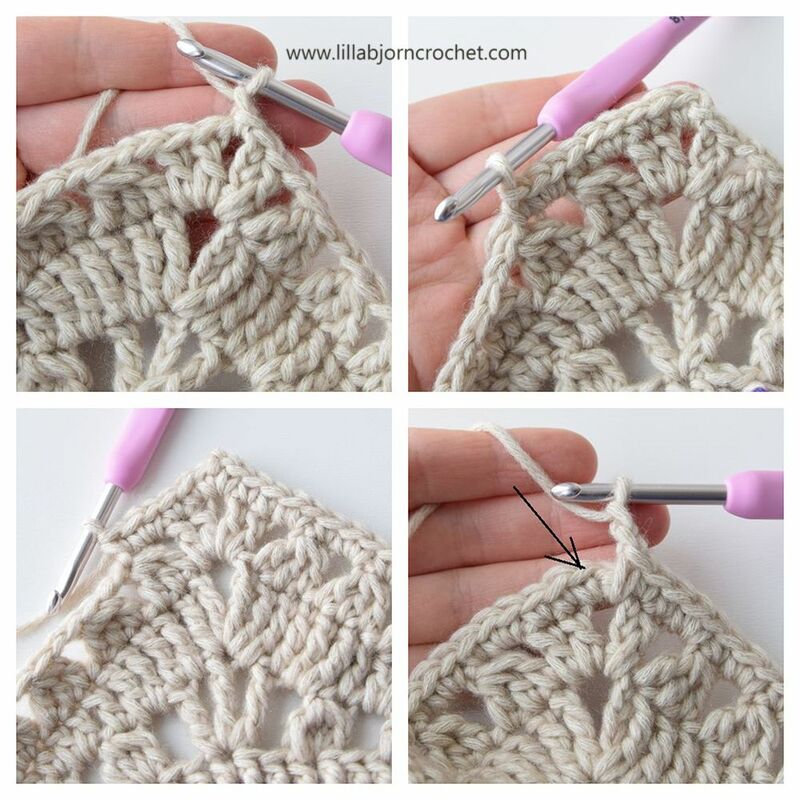 hdc (half double crochet) – yo, insert hook in indicated st, yo, draw up a lp, yo, pull through all three lps. 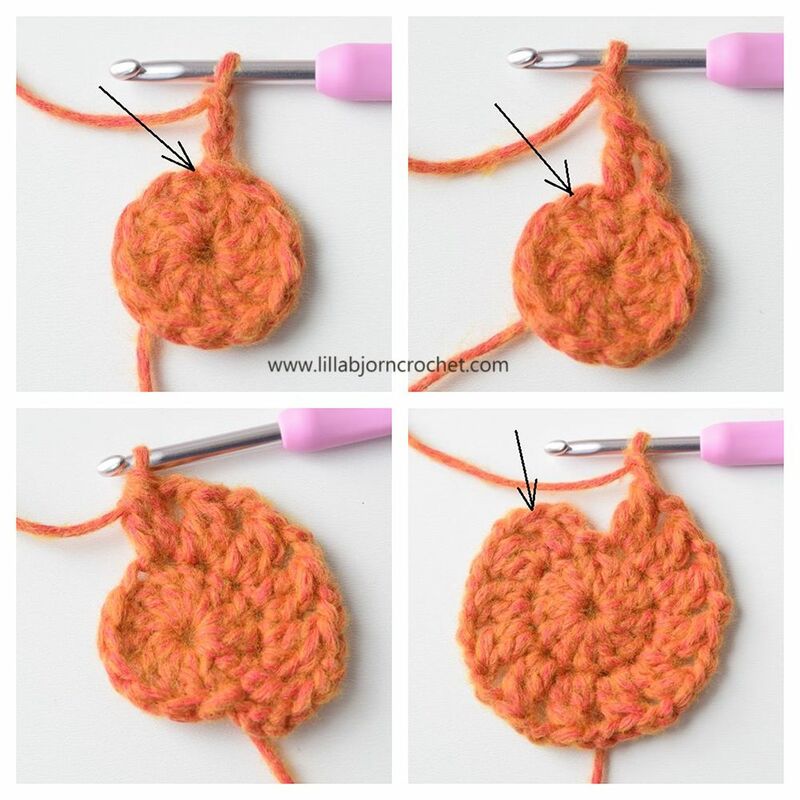 tr (treble crochet) – yo twice, insert hook in indicated st, yo, draw up a lp, *yo, pull through 2 lps* three times. dc2tog (double crochet 2 together) – *yo, insert hook in indicated st, yo, draw up a lp, yo, pull through 2 lps; repeat from * once more, yo, pull through all 3 lps on hook. dc3tog (double crochet 3 together) – *yo, insert hook in indicated st, yo, draw up a lp, yo, pull through 2 lps; repeat from * twice more yo, pull through all 4 lps on hook. 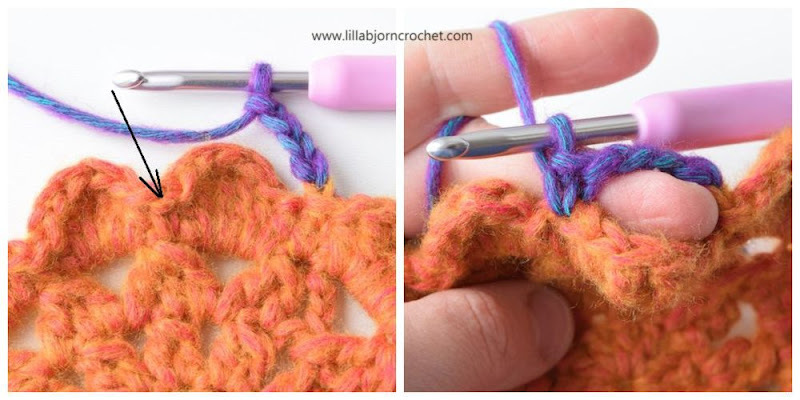 dc4tog (double crochet 4 together) – *yo, insert hook in indicated st, yo, draw up a lp, yo, pull through 2 lps; repeat from * 3 more times in same stitch, yo, pull through all 5 lps on hook. 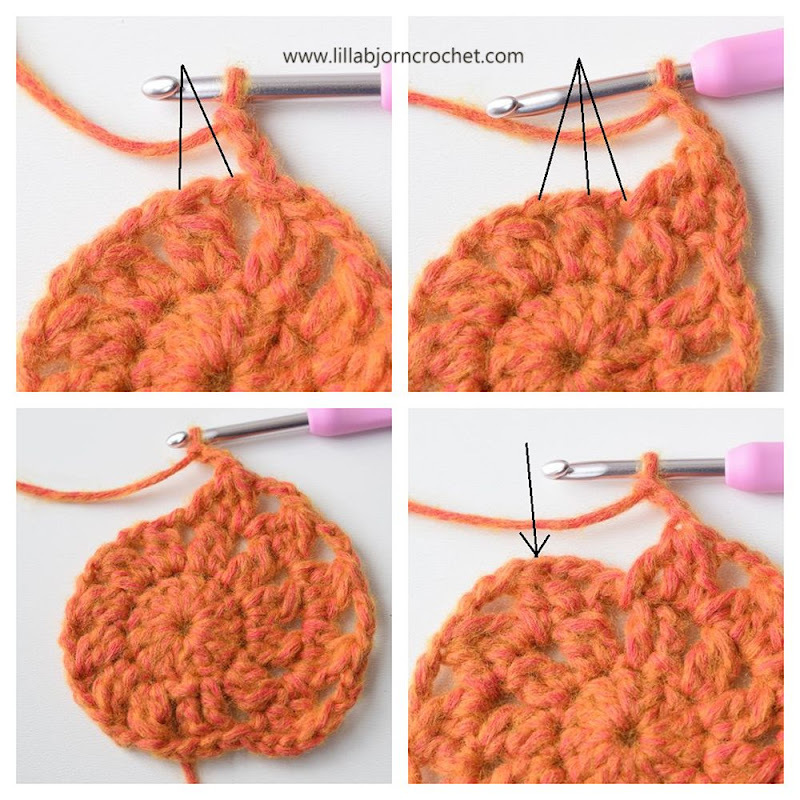 BPdc (back post double crochet) – yo, insert hook from back to front to back around the post of indicated stitch, yo, draw up a lp, *yo, pull through 2 lps; repeat from * once more. An original Lilla Björn Crochet Design (Tatsiana Kupryianchyk). Copyright 2014-2019. All rights reserved. This pattern is for personal use only. 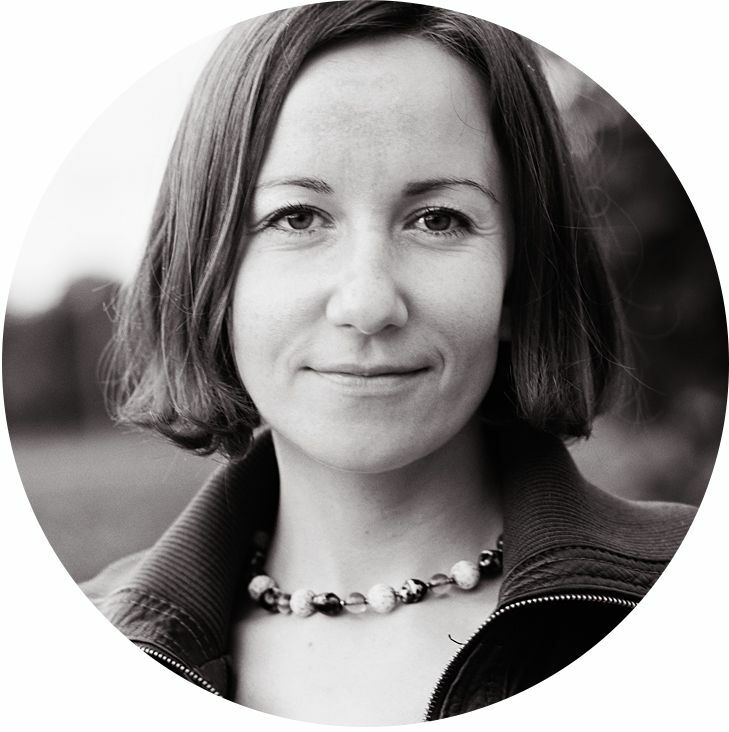 It cannot be sold, shared, republished (online and off-line), redistributed, translated without permission or edited in any way – in part or in a whole. No video tutorials are allowed without permission! Please, always credit me as a designer. Thank you! Round 1. With Yarn A make magic ring, ch2 (doesn’t count as a st), 12dc in ring, tighten ring, join with ss in first dc after ch2 – 12 dc. Round 2. Ch3 and dc in the same st as join (counts as first dc2tog), ch2, *dc2tog in next st, ch2* 11 times, join with ss in first dc after ch3 – 12 dc2tog, 12 ch2-sps. Round 3. First leg of first dc3tog will be ch3. Ss in next ch2-sp, *dc3tog (over same sp, next dc2tog and next sp), ch3* 12 times, join with ss in first dc3tog – 12 dc3tog, 12 ch3-sps. Round 4. Ch1 (doesn’t count as a st), *sc in dc3tog, (hdc, dc, 2tr, dc, hdc) in next ch3-sp - petal made* 12 times, join with ss in first sc – 12 “petals”. Cut yarn if changing color. Round 5. Continue with Yarn A or change to Yarn B in first ch1. Work behind the petals. *Ch5, skip petal, sc in next sc* 12 times. Make last sc over joining ss of the previous round – 12 sc, 12 ch5-sps. Round 6. Ch2 (doesn’t count as a st), *5dc in next ch5-sp* 12 times, join with ss in first dc after ch2 – 60 dc. Round 7. First dc is made in same st as join. Ch2 (doesn’t count as a st), *2dc, tr in sp between 2tr of the petal below, skip 1 st on Round 6, 2dc, dc between current and next dc of Round 6* 12 times, join with ss in first dc after ch2 – 60 dc, 12 tr. Round 8. First leg of first dc3tog will be ch3. *Dc3tog over next 3 sts, ch3* 24 times, join with ss in first dc3tog – 24 dc3tog, 24 ch3-sps. Round 9. First dc is made in same st as join. Ch2 (doesn’t count as a st), *dc in dc3tog, 3dc in next сh3-sp* 24 times, join with ss in first dc after ch2 – 96 dc. Fasten off if changing colour. Round 10. Continue with Yarn A or change to Yarn C in first ch1. First BPdc is made around first dc of previous round (after ch2). Ch2 (doesn’t count as a st), *BPdc around each of next 4 sts, 2BPdc around next st, BPdc around each of next 3 sts* 12 times, join with ss in first BPdc after ch2 – 108 BPdc. Ss in each of next 2 sts, *tr in same st, ch1, tr in same st, ch2, skip 2 sts, dc4tog in next st, ch2, skip 2 sts, 2dc, 3hdc, 6sc, 3hdc, 2dc, ch2, skip 2 sts, dc4tog in next st, ch2, skip 2 sts, tr in next st, ch1* 4 times working last tr in the same st as the first tr, join with ss in fourth ch in the beginning of the round – 2 tr, 2 dc4tog, 4 dc, 6 hdc, 6sc, 4 ch2-sps and 2 ch1-sps on each side, tr in each corner. *Tr in same tr, ch2, 2tr in same tr, tr in next ch1-sp, tr in next tr, 2tr in next ch2-sp, dc in next dc4tog, 2dc in next ch2-sp, hdc in each of next 3 sts, 4sc, sc2tog over next 2 sts, 4sc, hdc in each of next 3 sts, 2dc in next ch2-sp, dc in next dc4tog, 2tr in next ch2-sp, tr in next tr, tr in next ch1-sp, tr in next tr* 4 times making last tr in the same st as the first tr, join with ss in fourth ch in the beginning of the round – 12 tr, 6 dc, 6 hdc, 8 sc and sc2tog on each side, ch2-sp in each corner. Ss in sp, *dc in same sp, ch2, 2dc in same sp, (ch2, dc3tog over next 3 sts) x11 times, ch2, dc in next sp* 4 times making last dc in the same sp as the first dc, join with ss in third ch in the beginning of the round – 4 dc, 11 dc3tog and 12 ch2-sps on each side, ch2-sp in each corner. Round 14. Ss in sp, ch1 (doesn’t count as a st), *sc in same ch2-sp in the corner, sc in each of next 2 sts, (2sc in next sp, sc in next dc3tog) x 11 times, 2sc in next sp, sc in each of next 2 sts, sc in next ch2-sp in the corner, ch2* 4 times making last sc in the same sp as the first sc, join with ss in first sc, fasten off – 41 sc on each side, ch2-sp in each corner. Congratulations! 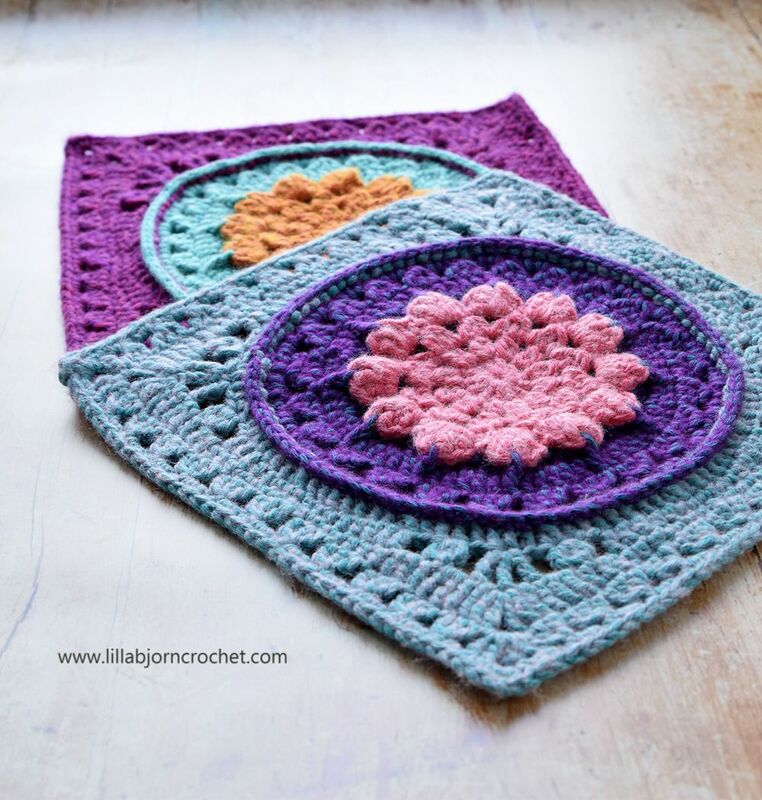 Your Water Lilly 12" Afghan Square is now finished! That's a so nice pattern, thank you so much ! I searched for the color numbers you provided and couldn’t find them in Riverwashed XL. It is only available in Riverwashed. Is that the yarn you want us to use? If it is the XL, can you tell us what are the name of the colors as it would help locate the yarn? Thank you.